Natural and traditional cleaners. Cleanses, refreshes & rejuvenates all types of leather. 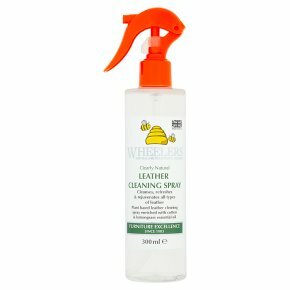 Plant based leather cleaning spray enriched with cotton & lemongrass essential oil. More than 98% natural ingredients.This leather cleaning spray lifts dirt and grime with natural plant extracts not harmful detergents. Brings out the beautiful finish of your leather, enhanced with essential oils of cotton and lemongrass. NB - Not recommended for ANILINE Leather<br><br>Open and handle with care.<br>Avoid contact with upholstery and fabrics.